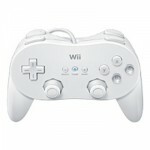 Without knowing this is a specially crafted controller for the Wii, this could easily be mistaken for one of those crappy controllers you get to enhance PC gaming or a makeshift Xbox controller S (presuming you ignore the Wii logo). If the Club Nintendo Edition Super Famicom Controller was a little out of your price range, the Classic Controller Pro could be a more affordable option to bring standard and old skool gaming control to your Wii gameplay. We don’t actually know at this point if it’s going to be pocket friendly, but it has to be cheaper than a retro SNES controller that’s been supped up for the Wii, right? The controller itself features spaced out thumbsticks as well as extra shoulder buttons and hand grips, which should give retro gamers something to be excited about or appease the more serious gamers who want the best of both controller worlds. Availability and pricing deets are unknown at this point, just that it’s coming in the Summer. But rest assured it is coming.